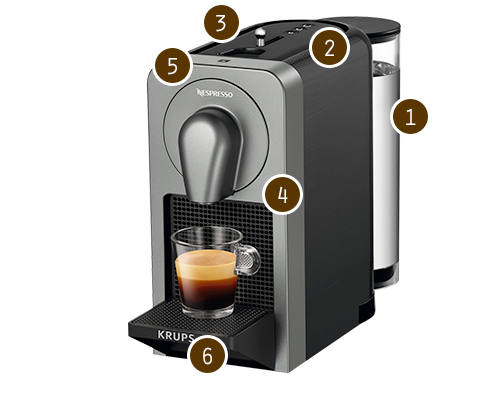 Meet the new Nespresso Prodigio&Milk coffee machine perfect for creating the delicious espresso, lungo, cappuccino or latte macchiato. Savouring a Nespresso Grand Cru coffee is now even simpler as Prodigio takes full advantage of your smartphone. Linked with the Nespresso app, Prodigio represents the ultimate in coffee machine connectivity. Discover the benefits of being connected: never run out of capsules, the apps knows when to reorder; treat yourself to a moment of pleasure, program a coffee for your desired time or brew now; and if your machine requires attention, the app will let you know. Prodigio&Milk offers a compact design and a rotating water tank the coffee machine adapts to fits your space. 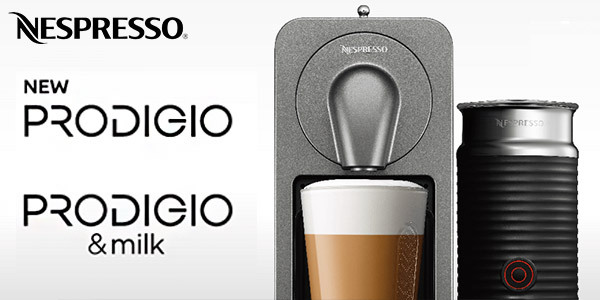 Prodigio has three pre-programmed coffee settings: ristretto, espresso and lungo. With the addition of the Aeroccino3 on Prodigio&Milk you can quickly and simply create indulgent cappuccinos and lattes with fresh milk. All Nespresso coffee machines come with 16 complimentary capsules from the collection of Grand Cru coffees, allowing you to try a range of Nespresso’s premium coffee and discover your favourite Grand Cru coffee.